We just finished talking about quadric surfaces in the Calculus III class that I’m teaching, so the timing was perfect to make my own. 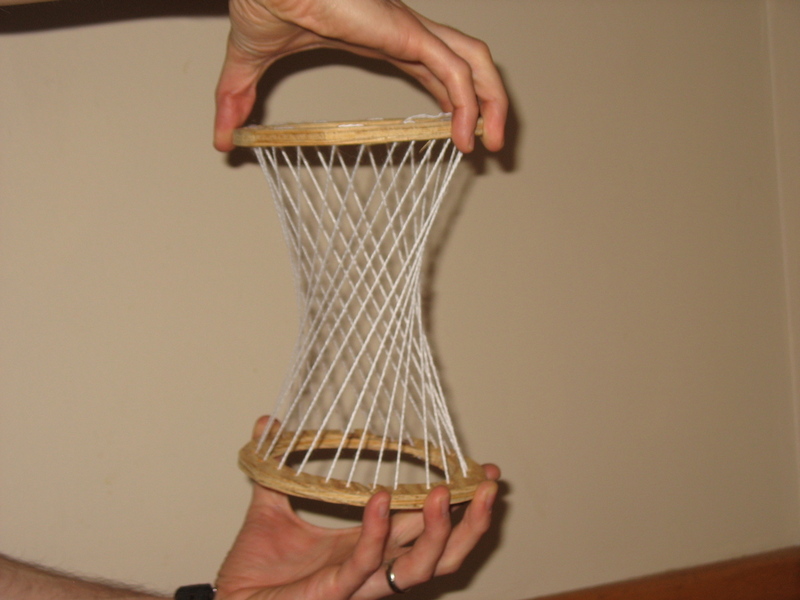 A hyperboloid of one sheet has the amazing property that it is a ruled surface. That is, it is the the union of straight lines. Actually, it is doubly ruled—there are two straight lines through every point on the surface. 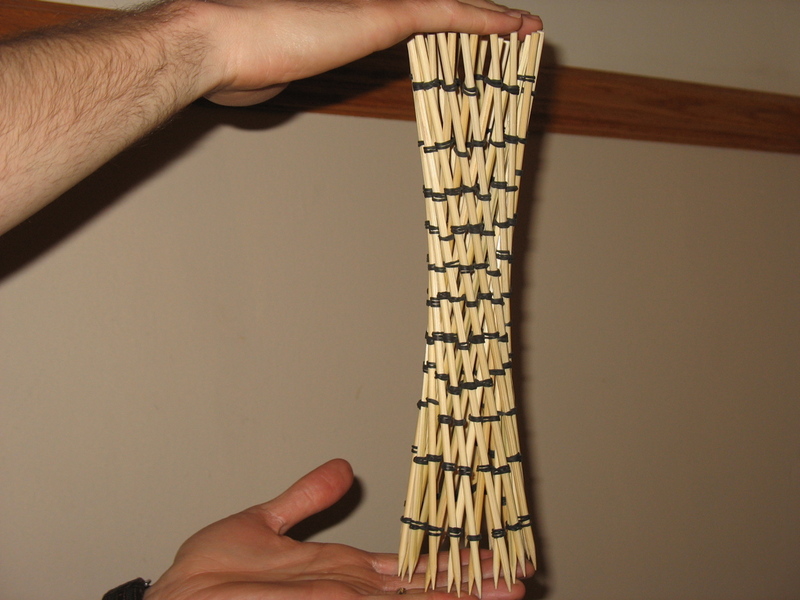 The fact that the hyperboloid is doubly ruled allows us to make it out of skewers. Here are photos of the final product. Left on its own the rubber bands pull the sculpture into a solid column. 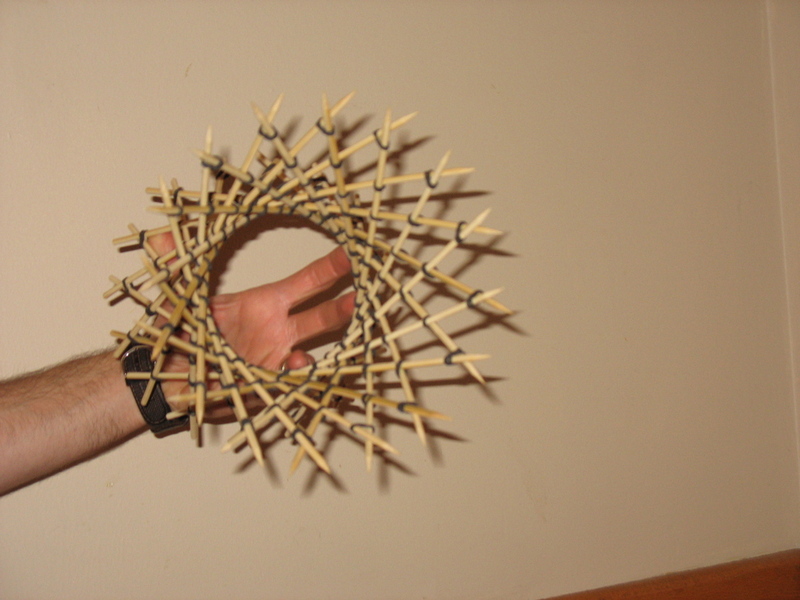 Twist the top and bottom (being careful of the pointy ends) and it opens into a hyperboloid. 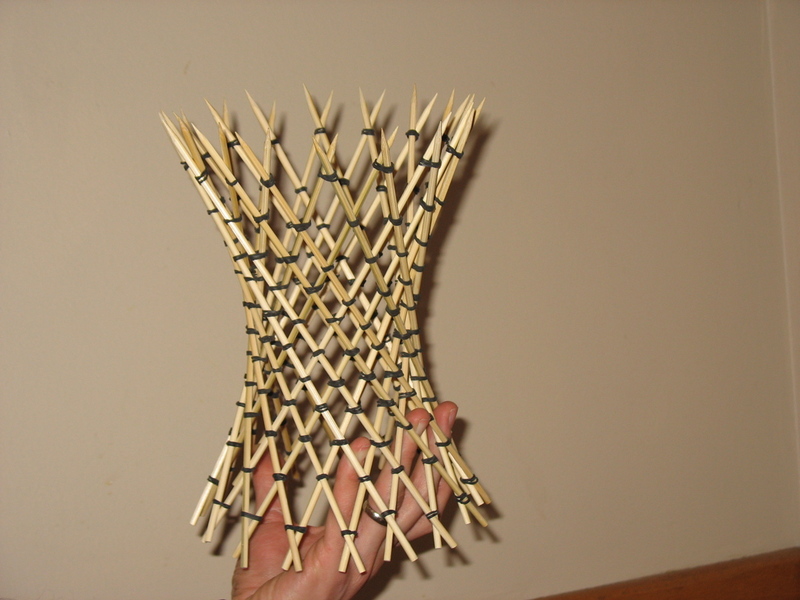 A few years ago I made another physical model of a hyperboloid. I used a jig saw to cut two circles out of wood, drilled holes in them, and threaded string between them. 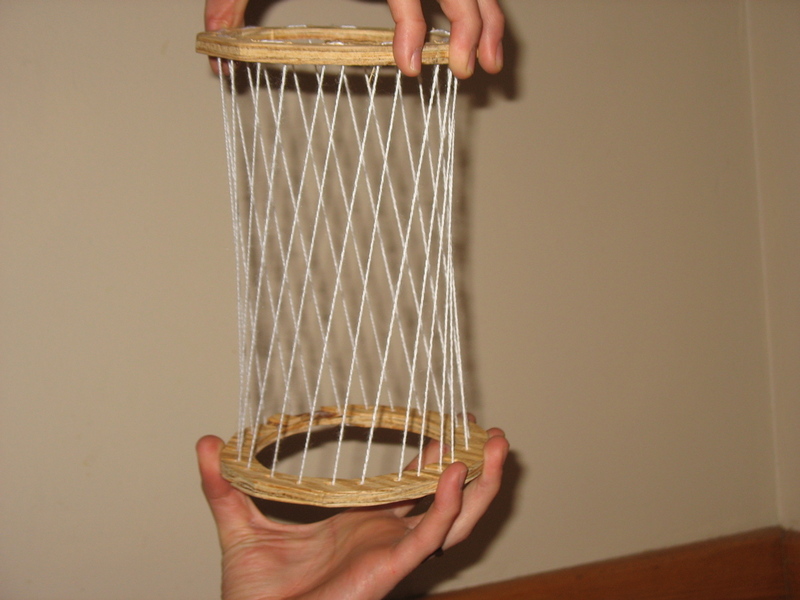 Then, when the two circles are twisted opposite directions the strings stay straight and form a hyperboloid. Next Post Woo hoo! A power of 10! Hooray! Here’s to an arbitrary milestone! For those of us without jigsaws, how about tying the string to embroidery hoops? Good idea. It is important to get all of the strings the same length, though. That would be tricky (although not impossible) if you’re tying them one at a time. I weaved one long string up and down on my circles. Then I could adjust them afterward for fine-tuning. There’s a Museum of Mathematics ?! Thanks very much, this is the first I heard of it. Is it in northern Long Island about halfway out to Montauk and the Hamptons? That’s where the address seems to be. It looks fairly new, and what a sad commentary on American Education that it’s the only one of it’s kind in our Country. Thanks again Professor Richeson for making us aware of this. I’ve never been to the actual Museum of Mathematics, but I saw their Math Midway traveling exhibit. I wrote about it here: https://divisbyzero.com/2009/12/30/math-midway-at-the-da-vinci-science-center/.